My summer wardrobe includes a variety of very lightweight jackets, cardigans, and kimonos which allow my arms and middle to be covered without making me feel too hot. The fabrics include crepe, almost sheer knits or polyester blends, and rayon. When the shapes float across the body and the style is open and airy, I can wear the toppers even on a very hot day. I am always more comfortable with some coverage. I do not wear shorts, tees or a tank top unlayered with flip flops because I do not find that look to be comfortable for my personality, more about that later in the week. 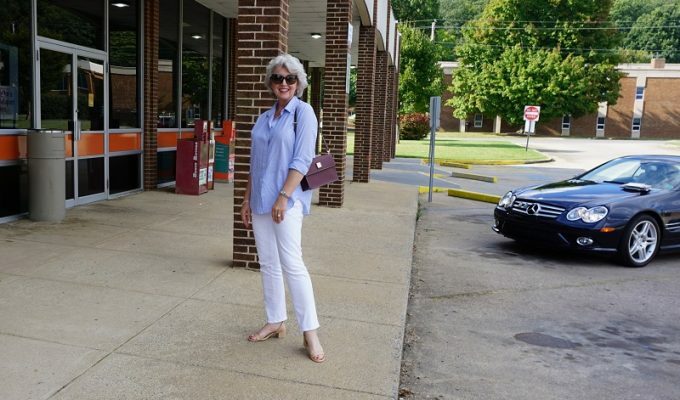 A loose fitting tank top and a pair of soft, comfortable jeans form the foundation of many of my looks, because I live in a temperate climate and I usually work from home. The next layer might be a lightweight cardigan or a floaty kimono. The jeans are usually white or faded (but never torn) since lighter colors are cooler than the dark wash ones. I look for summer jean style pants made from materials which are lighter weight than denim. Some of my favorites are made from cotton or sateen. These jeans and this tank are from Chico’s. The sandals are by Montana via Dillard’s. The handbag and my watch are by Michael Kors. The necklace is this one from French Kande. I would wear this look to run errands such as going to the grocery store or the office supply store. 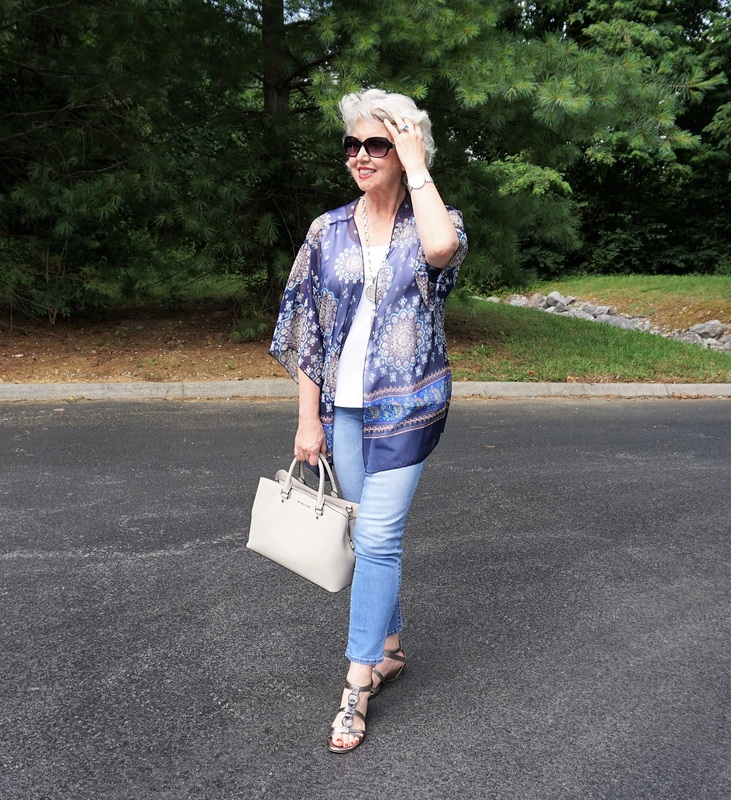 The cute blue kimono I am wearing is from my online shop here. I have several styles of cardigans and kimonos in lightweight flowing fabrics. Keep in mind that mine is a very small business which is just getting started so the selections may sell out quickly. Thank you so much for shopping with me here! Can I ask if your shop mails to the U.K. ? Love your kimono jackets but cannot find similar here. I am happy to ship worldwide. If my site charges you too much for the shipping (based on total order dollar value), I will promptly give you a refund when I know the actual cost to ship your items. Love your style. It has helped me this past year develop my style and wardrobe. Love this kimono, I have placed my name on wait list for it. Love this comfy classy casual look! It’s me! Susan, thank you for pulling it all together for me & for sharing the look! Do you ever wear capri pants? I never wear shorts either, but find capri pants a nice alternative to jeans when the weather gets too hot. 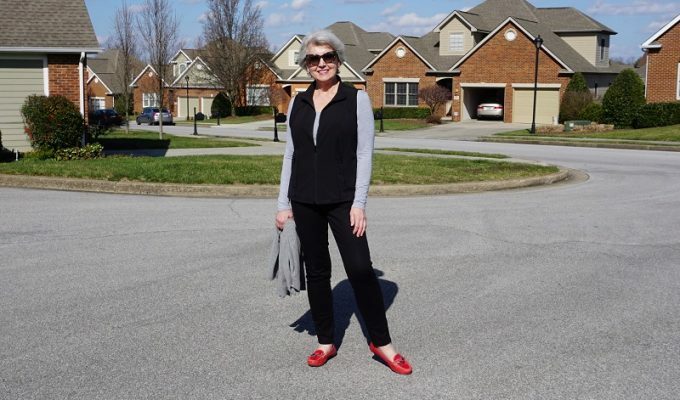 I sometimes wear ankle pants which end at the slender part of my leg above the ankle but capri pants do not land at the right place on my leg. They make me look shorter and much heavier. 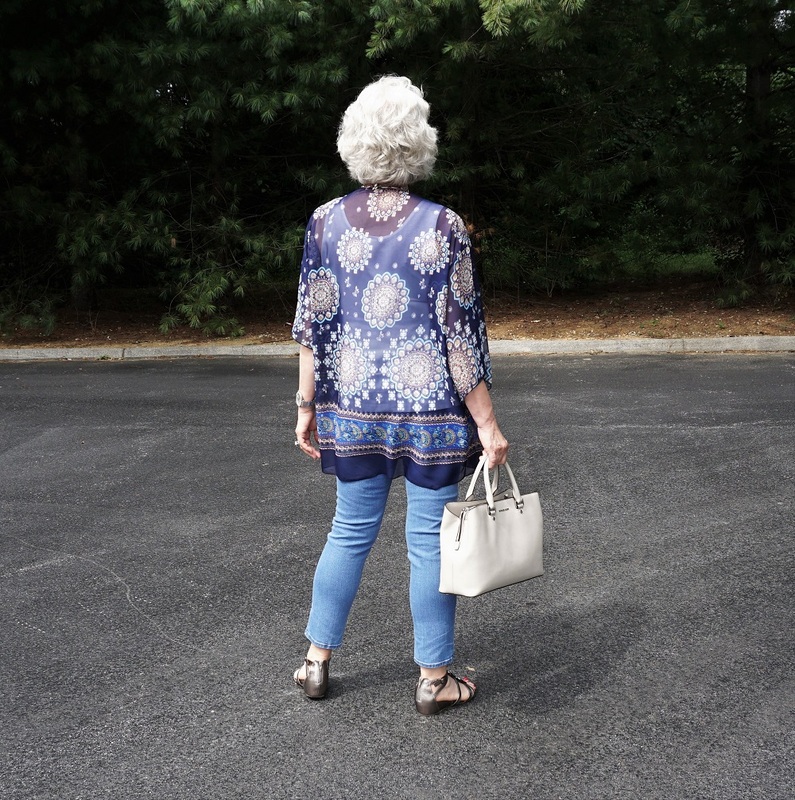 Susan, Thank you soo much for this blog – you are an inspiration! I have been looking at kimonos but wasn’t sure. You have convinced me! The kimono top is beautiful. Do your jeans button and have a zipper, or do they have an elastic waist? I enjoy your blog very much, here in Arizona I dress the same as you in the fall and winter here as you do in the spring and summer where you live. The summers here can reach 120 degrees,I wish I could wear the things that you show in the summer. I enjoy your blog very much. 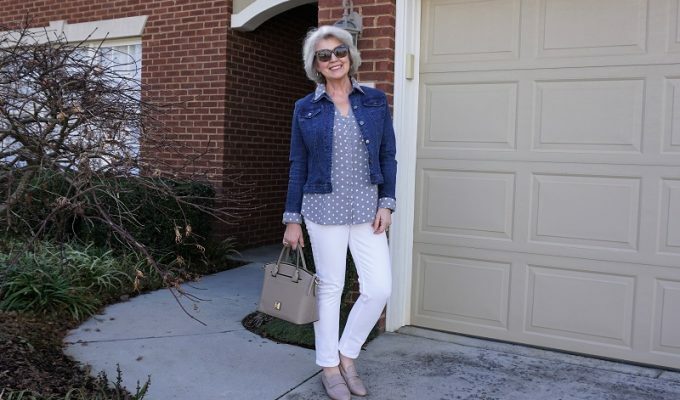 The jeans I am wearing here are classic jeans style with a zipper a button and pockets. Darn it! The kimono must be sold out. Will you be getting more in? Thanks! I am afraid it is too late to get more of that style. I live in coastal NC. 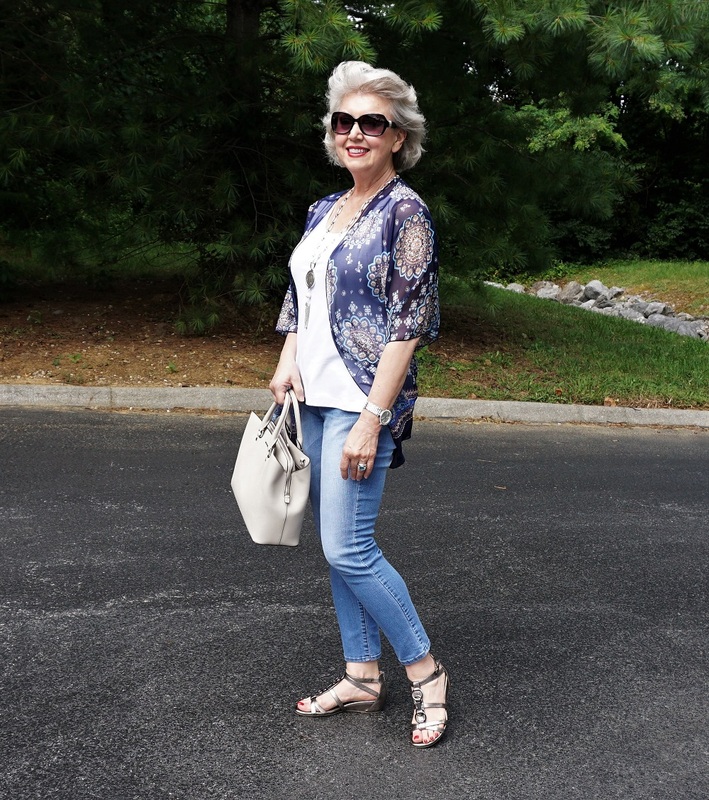 It is too hot here for jeans in the summer but love your layered top. I’ll have to look for some “floaty” things. A nice way to dress up casual jeans and top. I have recently bought cotton and linen shirts from Foxcroft. They seem to work well in SC summer heat. 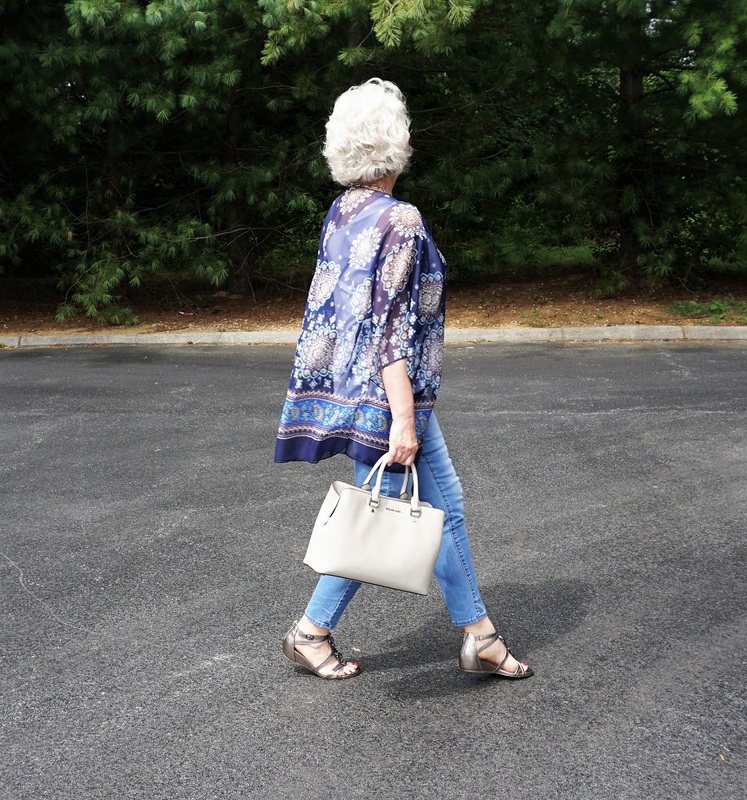 I’ve found some kimonos on Nordstrom Rack not too long ago. Susan, such a pretty and feminine look! Thank you for posting. I enjoy your blog so much. You have a great sense of style. Thank you so much for sharing all of your tips! I would love to wear capris, but they don’t hit me at the right place either. Your kimono looks lovely. what age!!!! Thank you for sharing you. Love that kimono on you. Looks a little Bo ho. I love ALL your great Information, your style is my personal taste, Great pictures, I’ve learned so much from your site,I just turned 65,and peite 5ft☺ you look great for 60yrs. Thank you so much for sharing your time, stories,and fashion shows. lm ready to start living a little myself from your friend Barbara..